A video showing an experimental system that provides the real-time noise signature pattern for helicopters was played at the Fly Neighborly session yesterday here at Heli-Expo. Noise produced by helicopters flying overhead not only continues to be a concern, but it is becoming a greater irritant as communities expand and more helicopters take to the air. While noise reduction remains an important goal of rotorcraft manufacturers and there are many cooperative efforts among helicopter operators, the FAA and communities about helicopter routing and altitudes, concerns and complaints about helicopter noise continue to increase. What is perhaps not well known among some pilots are ways they can mitigate their helicopter’s noise footprint by the way they fly. Based on extensive research, these scientifically demonstrated techniques are rarely, if ever, taught in flight school, but they are now becoming more commonly used and some flight departments have begun to incorporate such techniques into their standard operating procedures. The well-attended presentation included real-world examples of standard operating procedures that can help mitigate noise. The information was extensive and well presented. Burgess and Bjellos even invited the audience to participate via text in an electronic survey, the results of which appeared on the big screen in front of the room. Among the questions: “If you are aware of noise-mitigation techniques, do you incorporate them in daily flight ops?” Seventeen percent answered less than 25 percent of the time; another 17 percent answered 25-50 percent of the time; and 67 percent answered more than 50 percent of the time. Finally, and perhaps most impressively, Burgess and Bjellos presented a video of an experimental device that provides pilots with immediate and graphical information about the “Fly Neighborly” status of their route. So what can pilots do about flying neighborly right now? aviation manager, Agro Industrial Management, suggest that noise-reduction techniques can often be incorporated into flying procedures without compromising safety, but when they do conflict, safety takes priority. 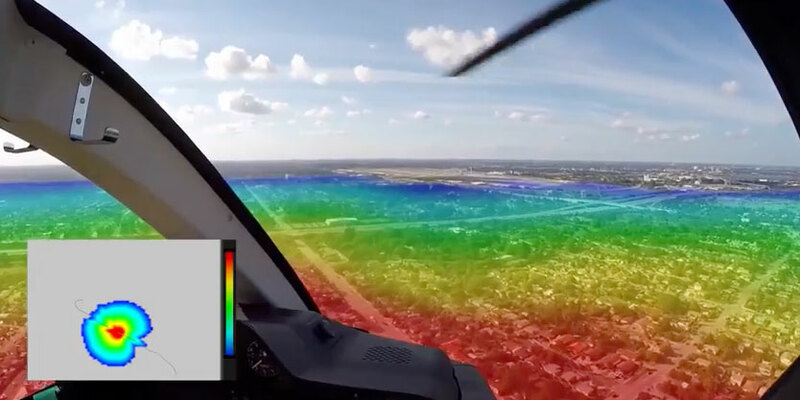 One thing some pilots (and passengers) may not know is that the noise they hear inside the helicopter is not representative of the noise that’s heard by people on the ground or recorded by noise sensors. The biggest factor of rotorcraft noise is blade-vortex interaction, which itself is affected by temperature and altitude. All other things considered equal, flying at a higher altitude en route has noise-reduction benefits. Higher altitude and slower forward speed are the quietest combination. Suggested en route altitudes are: small helicopters—1,000 feet agl; medium helicopters—2,000 feet agl; large helicopters—4,000 feet agl. On an approach to landing, steep descents create the least noise and moderate descents create the most noise. Shallow descents are in the middle of these two. Avoid decelerating over a noise-sensitive area. Every time the aircraft is maneuvered, it makes more noise. Smooth control inputs reduce the noise footprint. In general, a single steady-state maneuver—turning, descending or increasing or decreasing airspeed—creates more noise than straight-and-level flight at a constant airspeed. Deceleration in level flight creates noise. The descent and decelerating phases of flight produce the highest levels of blade vortex interaction. Doing multiple maneuvers simultaneously—turning while descending, reducing airspeed while turning or worst of all turning, descending and reducing airspeed at the same time—creates even more noise. However, climbing turns are quieter than level/descending turns. Accelerating climbs are quieter than steady-state decelerating climbs. And probably the most counter-intuitive: turning away from the advancing blade in a turn is quieter than turning into it. Descending, decelerating LEFT turns are quieter than descending, decelerating RIGHT turns for left-turning rotors. It is the opposite for right-turning rotors. Route planning to avoid noise-sensitive areas requires comprehensive evaluation of these areas. Noise-abatement procedures should be pursued by helicopter pilots (and operators) and ATC.